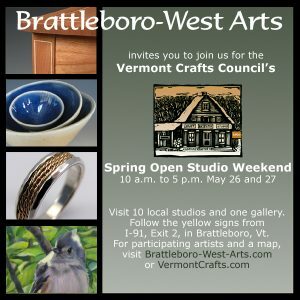 BRATTLEBORO, Vt.: The Vermont Craft Council’s Spring Open Studio (Memorial Day) Weekend May 26-27 will include 12 artists in 10 studios and one gallery in Brattleboro, West Brattleboro and Marlboro. Of those artists, eight are members of Brattleboro-West Arts. Participating studios will be open to the public from 10 a.m. to 5 p.m. each day, with many sites offering demonstrations as well as the opportunity to purchase art and talk to the professional artists who made it. During the month of May, visitors to the Vermont Welcome Center on Interstate 91 northbound in Guilford, Vt., can preview samples of works from several studios on the tour. Here is the complete lineup of tour stops in the Brattleboro area, listed according to their site numbers on the statewide tour. The studios marked with * are those of Brattleboro-West Arts members. *93. Applewoods Woodworking Studio and Gallery, David and Michelle Holzapfel: 2802 Rt. 9 Marlboro. *94. Matthew Tell Pottery: Potters Hill Road, Marlboro. *95. Chris Lann Designs silver jewelry: 1420 Sunset Lake Road, Brattleboro. *96. Greg Moschetti, landscapes in oil paint: 623 Kelly Road, Dummerston. *97. Orchard Street Pottery, Walter Slowinski: 658 Orchard St., Brattleboro. *98. Lesley Heathcote, pastels of animals and nature: 32 Larkin St., Brattleboro. 99. Vermont Mosaics and Waring Music, mosaic art, jewelry and folk instruments by Susan Rosano and Dennis Waring: 82 Country Drive, Guilford. *100. Jason Breen Fine and Custom Woodworking: 1197 Bonnyvale Road, Brattleboro. 101. Vitriesse Glass Studio, Lucy Bergamini: 122 Birge St #21, Brattleboro. 102. Vermont Artisan Designs (Tour information center): 106 Main St., Brattleboro. 103. Colorquilts, dyed fabric, quilts and wooden jigsaw puzzles by Carlene Raper: 62 Spruce St., Brattleboro. For profiles of participating artists, as well as links to interactive maps and other resources to help enjoy the weekend around Brattleboro, visit www.brattleboro-west-arts.com/osw. For a complete list and maps of tour stops statewide, visit www.vermontcrafts.com. Brattleboro-West Arts is a group of about three dozen artists who create their art and make their homes within the watershed of the Whetstone Brook. 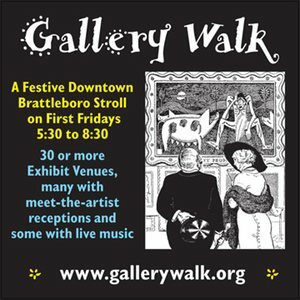 For details about Brattleboro-West Arts, including profiles of member artists and information about this and other events, visit www.brattleboro-west-arts.com.